This article is about the Mars probe from India. For other Mars orbiters, see List of Mars orbiters and List of missions to Mars. The Mars Orbiter Mission probe lifted-off from the First Launch Pad at Satish Dhawan Space Centre (Sriharikota Range SHAR), Andhra Pradesh, using a Polar Satellite Launch Vehicle (PSLV) rocket C25 at 09:08 UTC on 5 November 2013. The launch window was approximately 20 days long and started on 28 October 2013. The MOM probe spent about a month in Earth orbit, where it made a series of seven apogee-raising orbital manoeuvres before trans-Mars injection on 30 November 2013 (UTC). After a 298-day transit to Mars, it was inserted into Mars orbit on 24 September 2014. The mission is a "technology demonstrator" project to develop the technologies for designing, planning, management, and operations of an interplanetary mission. It carries five instruments that will help advance knowledge about Mars to achieve its secondary, scientific objective. The spacecraft is currently being monitored from the Spacecraft Control Centre at ISRO Telemetry, Tracking and Command Network (ISTRAC) in Bengaluru with support from the Indian Deep Space Network (IDSN) antennae at Byalalu, Karnataka. On 23 November 2008, the first public acknowledgement of an unmanned mission to Mars was announced by then-ISRO chairman G. Madhavan Nair. The MOM mission concept began with a feasibility study in 2010 by the Indian Institute of Space Science and Technology after the launch of lunar satellite Chandrayaan-1 in 2008. Prime Minister Manmohan Singh approved the project on 3 August 2012, after the Indian Space Research Organisation completed ₹125 crore (US$17 million) of required studies for the orbiter. The total project cost may be up to ₹454 crore (US$63 million). The satellite costs ₹153 crore (US$21 million) and the rest of the budget has been attributed to ground stations and relay upgrades that will be used for other ISRO projects. The space agency had planned the launch on 28 October 2013 but was postponed to 5 November following the delay in ISRO's spacecraft tracking ships to take up pre-determined positions due to poor weather in the Pacific Ocean. Launch opportunities for a fuel-saving Hohmann transfer orbit occur every 26 months, in this case the next two would be in 2016 and 2018. Assembly of the PSLV-XL launch vehicle, designated C25, started on 5 August 2013. The mounting of the five scientific instruments was completed at Indian Space Research Organisation Satellite Centre, Bengaluru, and the finished spacecraft was shipped to Sriharikota on 2 October 2013 for integration to the PSLV-XL launch vehicle. The satellite's development was fast-tracked and completed in a record 15 months. Despite the US federal government shutdown, NASA reaffirmed on 5 October 2013 it would provide communications and navigation support to the mission. During a meeting on 30 September 2014, NASA and ISRO officials signed an agreement to establish a pathway for future joint missions to explore Mars. One of the working group's objectives will be to explore potential coordinated observations and science analysis between the MAVEN orbiter and MOM, as well as other current and future Mars missions. The total cost of the mission was approximately ₹450 Crore (US$73 million), making it the least-expensive Mars mission to date. The low cost of the mission was ascribed by K. Radhakrishnan, the chairman of ISRO, to various factors, including a "modular approach", few ground tests and long (18–20 hour) working days for scientists. BBC's Jonathan Amos mentioned lower worker costs, home-grown technologies, simpler design, and a significantly less complicated payload than NASA's MAVEN. Artist's rendering of the Mars Orbiter Mission spacecraft, with Mars in the background. The primary objective of the mission is to develop the technologies required for designing, planning, management and operations of an interplanetary mission. The secondary objective is to explore Mars' surface features, morphology, mineralogy and Martian atmosphere using indigenous scientific instruments. Mass: The lift-off mass was 1,337.2 kg (2,948 lb), including 852 kg (1,878 lb) of propellant. Bus: The spacecraft's bus is a modified I-1 K structure and propulsion hardware configuration, similar to Chandrayaan-1, India's lunar orbiter that operated from 2008 to 2009, with specific improvements and upgrades needed for a Mars mission. The satellite structure is constructed of an aluminium and composite fibre reinforced plastic (CFRP) sandwich construction. Power: Electric power is generated by three solar array panels of 1.8 m × 1.4 m (5 ft 11 in × 4 ft 7 in) each (7.56 m2 (81.4 sq ft) total), for a maximum of 840 watts of power generation in Mars orbit. Electricity is stored in a 36 Ah Lithium-ion battery. Propulsion: A liquid fuel engine with a thrust of 440 newtons (99 lbf) is used for orbit raising and insertion into Mars orbit. The orbiter also has eight 22-newton (4.9 lbf) thrusters for attitude control. Its propellant mass at launch was 852 kg (1,878 lb). Attitude and Orbit Control System: Maneuvering system that includes electronics with a MAR31750 processor, two star sensors, a solar panel Sun sensor, a coarse analog Sun sensor, four reaction wheels, and the primary propulsion system. Generation of hydrogen and deuterium coronal profiles. Methane Sensor for Mars (MSM) – was meant to measure methane in the atmosphere of Mars, if any, and map its sources with an accuracy of parts-per-billion (ppb). After entering Mars orbit it was determined that the instrument, although in good working condition, had a design flaw and it was not capable of detecting methane. :57 The instrument was repurposed as an albedo mapper. The ISRO Telemetry, Tracking and Command Network performed navigation and tracking operations for the launch with ground stations at Sriharikota, Port Blair, Brunei and Biak in Indonesia, and after the spacecraft's apogee became more than 100,000 km, an 18 m (59 ft) and a 32 m (105 ft) diameter antenna of the Indian Deep Space Network were utilised. The 18 m (59 ft) dish antenna was used for communication with the craft until April 2014, after which the larger 32 m (105 ft) antenna was used. NASA's Deep Space Network is providing position data through its three stations located in Canberra, Madrid and Goldstone on the US West Coast during the non-visible period of ISRO's network. The South African National Space Agency's (SANSA) Hartebeesthoek (HBK) ground station is also providing satellite tracking, telemetry and command services. Communications are handled by two 230-watt TWTAs and two coherent transponders. The antenna array consists of a low-gain antenna, a medium-gain antenna and a high-gain antenna. The high-gain antenna system is based on a single 2.2-metre (7 ft 3 in) reflector illuminated by a feed at S-band. It is used to transmit and receive the telemetry, tracking, commanding and data to and from the Indian Deep Space Network. As originally conceived, ISRO was to launch MOM on its Geosynchronous Satellite Launch Vehicle (GSLV), but as the GSLV failed twice in 2010 and ISRO was continuing to sort out issues with its cryogenic engine, it was not advisable to wait for the new batch of rockets as that would have delayed the MOM project for at least three years. ISRO opted to switch to the less-powerful Polar Satellite Launch Vehicle (PSLV). 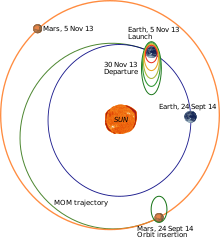 Since the PSLV was not powerful enough to place MOM on a direct-to-Mars trajectory, the spacecraft was launched into a highly elliptical Earth orbit and used its own thrusters over multiple perigee burns (to take advantage of the Oberth effect) to place itself on a trans-Mars trajectory. On 19 October 2013, ISRO chairman K. Radhakrishnan announced that the launch had to be postponed by a week as a result of a delay of a crucial telemetry ship reaching Fiji. The launch was rescheduled for 5 November 2013. ISRO's PSLV-XL placed the satellite into Earth orbit at 09:50 UTC on 5 November 2013, with a perigee of 264.1 km (164.1 mi), an apogee of 23,903.6 km (14,853.0 mi), and inclination of 19.20 degrees, with both the antenna and all three sections of the solar panel arrays deployed. During the first three orbit raising operations, ISRO progressively tested the spacecraft systems. The orbiter's dry mass is 500 kg (1,100 lb), and it carried 852 kg (1,878 lb) of fuel and oxidiser at launch. Its main engine, which is a derivative of the system used on India's communications satellites, uses the bipropellant combination monomethylhydrazine and dinitrogen tetroxide to achieve the thrust necessary for escape velocity from Earth. It was also used to slow down the probe for Mars orbit insertion and, subsequently, for orbit corrections. Several orbit raising operations were conducted from the Spacecraft Control Centre (SCC) at the ISRO Telemetry, Tracking and Command Network (ISTRAC) at Peenya, Bengaluru on 6, 7, 8, 10, 12 and 16 November by using the spacecraft's on-board propulsion system and a series of perigee burns. The first three of the five planned orbit raising manoeuvres were completed with nominal results, while the fourth was only partially successful. However, a subsequent supplementary manoeuvre raised the orbit to the intended altitude aimed for in the original fourth manoeuvre. A total of six burns were completed while the spacecraft remained in Earth orbit, with a seventh burn conducted on 30 November to insert MOM into a heliocentric orbit for its transit to Mars. The first orbit-raising manoeuvre was performed on 6 November 2013 at 19:47 UTC when the spacecraft's 440-newton (99 lbf) liquid engine was fired for 416 seconds. With this engine firing, the spacecraft's apogee was raised to 28,825 km (17,911 mi), with a perigee of 252 km (157 mi). The second orbit raising manoeuvre was performed on 7 November 2013 at 20:48 UTC, with a burn time of 570.6 seconds resulting in an apogee of 40,186 km (24,970 mi). The third orbit raising manoeuvre was performed on 8 November 2013 at 20:40 UTC, with a burn time of 707 seconds, resulting in an apogee of 71,636 km (44,513 mi). The fourth orbit raising manoeuvre, starting at 20:36 UTC on 10 November 2013, imparted an incremental velocity of 35 m/s (110 ft/s) to the spacecraft instead of the planned 135 m/s (440 ft/s) as a result of underburn by the motor. Because of this, the apogee was boosted to 78,276 km (48,638 mi) instead of the planned 100,000 km (62,000 mi). When testing the redundancies built-in for the propulsion system, the flow to the liquid engine stopped, with consequent reduction in incremental velocity. During the fourth orbit burn, the primary and redundant coils of the solenoid flow control valve of 440 newton liquid engine and logic for thrust augmentation by the attitude control thrusters were being tested. When both primary and redundant coils were energised together during the planned modes, the flow to the liquid engine stopped. Operating both the coils simultaneously is not possible for future operations, however they could be operated independently of each other, in sequence. As a result of the fourth planned burn coming up short, an additional unscheduled burn was performed on 12 November 2013 that increased the apogee to 118,642 km (73,721 mi), a slightly higher altitude than originally intended in the fourth manoeuvre. The apogee was raised to 192,874 km (119,846 mi) on 15 November 2013, 19:57 UTC in the final orbit raising manoeuvre. On 30 November 2013 at 19:19 UTC, a 23-minute engine firing initiated the transfer of MOM away from Earth orbit and on heliocentric trajectory toward Mars. The probe travelled a distance of 780,000,000 kilometres (480,000,000 mi) to reach Mars. Four trajectory corrections were originally planned, but only three were carried out. The first trajectory correction manoeuvre (TCM) was carried out on 11 December 2013 at 01:00 UTC by firing the 22-newton (4.9 lbf) thrusters for a duration of 40.5 seconds. After this event, MOM was following the designed trajectory so closely that the trajectory correction manoeuvre planned in April 2014 was not required. The second trajectory correction manoeuvre was performed on 11 June 2014 at 11:00 UTC by firing the spacecraft's 22 newton thrusters for a duration of 16 seconds. The third planned trajectory correction manoeuvre was postponed, due to the orbiter's trajectory closely matching the planned trajectory. The third trajectory correction was also a deceleration test 3.9 seconds long on 22 September 2014. The plan was for an insertion into Mars orbit on 24 September 2014, approximately 2 days after the arrival of NASA's MAVEN orbiter. The 440-newton liquid apogee motor was test fired on 22 September at 09:00 UTC for 3.968 seconds, about 41 hours before actual orbit insertion. After these events, the spacecraft performed a reverse manoeuvre to reorient from its deceleration burn and entered Martian orbit. Three frame Mars Orbiter Mission Mars Color Camera mosaic of the Syrtis Major region on September 24, 2015. The orbit insertion put MOM in a highly elliptical orbit around Mars, as planned, with a period of 72 hours 51 minutes 51 seconds, a periapsis of 421.7 km (262.0 mi) and apoapsis of 76,993.6 km (47,841.6 mi). At the end of the orbit insertion, MOM was left with 40 kg (88 lb) of fuel on board, more than the 20 kg (44 lb) necessary for a six-month mission. On 28 September 2014, MOM controllers published the spacecraft's first global view of Mars. The image was captured by the Mars Colour Camera (MCC). On 7 October 2014, the ISRO altered MOM's orbit so as to move it behind Mars for Comet Siding Spring's flyby of the planet on 19 October 2014. The spacecraft consumed 1.9 kg (4 lb) of fuel for the manoeuvre. As a result, MOM's apoapsis was reduced to 72,000 km (45,000 mi). After the comet passed by Mars, ISRO reported that MOM remained healthy. On 4 March 2015, the ISRO reported that the MSM instrument was functioning normally and are studying Mars' albedo, the reflectivity of the planet's surface. The Mars Colour Camera was also returning new images of the Martian surface. On 24 March 2015, MOM completed its initial six-month mission in orbit around Mars. ISRO extended the mission by an additional six months; the spacecraft has 37 kg (82 lb) of propellant remaining and all five of its scientific instruments are working properly. The orbiter can reportedly continue orbiting Mars for several years with its remaining propellant. On 24 September 2015, ISRO released its "Mars Atlas", a 120-page scientific atlas containing images and data from the Mars Orbiter Mission's first year in orbit. In March 2016, the first science results of the mission were published in Geophysical Research Letters, presenting measurements obtained by the spacecraft's MENCA instrument of the Martian exosphere. On 17 January 2017, MOM's orbit was altered to avoid the impending eclipse season. With a burn of eight 22 N thrusters for 431 seconds, resulting in a velocity difference of 97.5 metres per second (351 km/h) using 20 kilograms (44 lb) of propellant (leaving 13 kg remaining), eclipses were avoided until September 2017. The battery is able to handle eclipses of up to 100 minutes. On 19 May 2017, MOM reached 1,000 days (973 sols) in orbit around Mars. In that time, the spacecraft completed 388 orbits of the planet and relayed more than 715 images back to Earth. ISRO officials stated that it remains in good health. On 24 September 2018, MOM completed 4 years in its orbit around Mars, although the designed mission life was only six months. Over these years, MOM's Mars Colour Camera has captured over 980 images that were released to the public. The probe is still in good health and continues to work nominally. In 2014, China referred to India's successful Mars Orbiter Mission as the "Pride of Asia". The Mars Orbiter Mission team won US-based National Space Society's 2015 Space Pioneer Award in the science and engineering category. NSS said the award was given as the Indian agency successfully executed a Mars mission in its first attempt; and the spacecraft is in an elliptical orbit with a high apoapsis where, with its high resolution camera, it is taking full-disk colour imagery of Mars. Very few full disk images have ever been taken in the past, mostly on approach to the planet, as most imaging is done looking straight down in mapping mode. These images will aid planetary scientists. An image taken by the Mars Orbiter Mission spacecraft was the cover photo of the November 2016 issue of National Geographic magazine, for their story "Mars: Race to the Red Planet". ISRO plans to develop and launch a follow-up mission called Mars Orbiter Mission 2 (MOM-2 or Mangalyaan-2) with a greater scientific payload to Mars in 2022-2023. The orbiter will use aerobraking to reduce apoapsis of its initial orbit and reach an altitude more suitable for scientific observation. ^ "Mars Orbiter Spacecraft completes Engine Test, fine-tunes its Course". Spaceflight 101. 22 September 2014. Retrieved 24 September 2014. ^ a b c d e f g "Mars Orbiter Mission Spacecraft". Indian Space Research Organisation. Retrieved 23 December 2014. ^ a b c d Arunan, S.; Satish, R. (25 September 2015). "Mars Orbiter Mission spacecraft and its challenges". Current Science. 109 (6): 1061–1069. doi:10.18520/v109/i6/1061-1069. ^ a b Lakshmi, Rama (24 September 2014). "India becomes first Asian nation to reach Mars orbit, joins elite global space club". The Washington Post. Retrieved 25 September 2014. ^ a b c d "India to launch Mars Orbiter Mission on November 5". The Times of India. Times News Network. 22 October 2013. Retrieved 22 October 2013. ^ "Mars Orbiter Mission: Launch Vehicle". ISRO. Retrieved 23 December 2014. ^ a b Tucker, Harry (25 September 2014). "India becomes first country to enter Mars' orbit on their first attempt". Herald Sun. Agence France-Presse. Retrieved 24 September 2014. ^ a b c d e f "Mars Orbiter Spacecraft Successfully Inserted into Mars Orbit" (Press release). ISRO. 24 September 2014. Archived from the original on 25 September 2014. ^ "Mangalyaan". NASA. 2013. Retrieved 27 September 2014. ^ a b Walton, Zach (15 August 2012). "India Announces Mars Mission One Week After Landing". Web Pro News. Retrieved 8 September 2013. ^ "Manmohan Singh formally announces India's Mars mission". The Hindu. Press Trust of India. 15 August 2012. Retrieved 31 August 2012. ^ Bal, Hartosh Singh (30 August 2012). "BRICS in Space". The New York Times. Retrieved 31 August 2012. ^ Patairiya, Pawan Kumar (23 November 2013). "Why India Is Going to Mars". The New York Times. Retrieved 23 November 2013. ^ "India's Mars Shot". The New York Times. 25 September 2014. Retrieved 27 September 2014. ^ Chang, Jon M. (5 November 2013). "India Launches Mars Orbiter Mission, Heralds New Space Race". ABC News. Retrieved 6 November 2013. 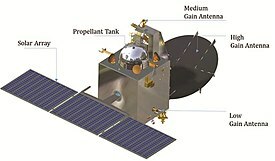 ^ "India's low-cost space mission reaches Mars orbit". Russia Today. 24 September 2014. Retrieved 24 September 2014. ^ Burke, Jason (24 September 2014). "India's Mars satellite successfully enters orbit, bringing country into space elite". The Guardian. Retrieved 24 September 2014. India has become the first nation to send a satellite into orbit around Mars on its first attempt, and the first Asian nation to do so. ^ Park, Madison (24 September 2014). "India's spacecraft reaches Mars orbit ... and history". CNN. Retrieved 24 September 2014. India's Mars Orbiter Mission successfully entered Mars' orbit Wednesday morning,making India the first nation to arrive on its first attempt and the first Asian country to reach the Red Planet. ^ Harris, Gardiner (24 September 2014). "On a Shoestring, India Sends Orbiter to Mars on Its First Try". The New York Times. Retrieved 25 September 2014. ^ "India's Mars Mission Mangalyaan to be launched on November 5". Bihar Prabha. 22 October 2013. Retrieved 22 October 2013. ^ a b "Mars Orbiter Mission: Latest Updates". ISRO. 2 December 2013. Archived from the original on 3 December 2013. ^ a b "Mars Orbiter Mission: Mission Objectives". ISRO. Archived from the original on 17 October 2013. Retrieved 8 October 2013. ^ a b Amos, Jonathan (24 September 2014). "Why India's Mars mission is so cheap – and thrilling". BBC News. Retrieved 25 September 2014. Its measurements of other atmospheric components will dovetail very nicely with Maven and the observations being made by Europe's Mars Express. "It means we'll be getting three-point measurements, which is tremendous." ^ "Mangalyaan successfully placed into Mars Transfer Trajectory". Bihar Prabha. 1 December 2013. Retrieved 1 December 2013. ^ "After Chandrayaan, its mission to Mars: Madhavan Nair". Oneindia. United News of India. 23 November 2008. Retrieved 1 April 2015. ^ "Manmohan Singh formally announces India's Mars mission". The Hindu. Press Trust of India. 15 August 2012. ^ "Cabinet clears Mars mission". The Hindu. 4 August 2012. Retrieved 10 August 2012. ^ a b "India's Mars mission gets Rs. 125 crore". Mars Daily. Indo-Asian News Service. 19 March 2012. Retrieved 4 February 2014. ^ "'We are planning to send our first orbiter to Mars in 2013'". Deccan Chronicle. 12 August 2012. Archived from the original on 12 August 2012. ^ Chaudhuri, Pramit Pal (6 November 2013). "Rocket science: how ISRO flew to Mars cheap". Hindustan Times. Retrieved 4 February 2014. ^ a b "India plans mission to Mars next year". The Daily Telegraph. 16 August 2012. Retrieved 8 September 2012. ^ a b Laxman, Srinivas (6 August 2013). "Isro kicks off Mars mission campaign with PSLV assembly". The Times of India. Times News Network. Retrieved 6 August 2013. ^ Bagla, Pallava (3 October 2013). "India's Mission Mars: The journey begins". NDTV. Retrieved 3 October 2013. ^ "NASA Reaffirms Support for Mars Orbiter Mission" (Press release). ISRO. 5 October 2013. Archived from the original on 17 October 2013. ^ "U.S., India to Collaborate on Mars Exploration, Earth-Observing Mission" (Press release). NASA. 30 September 2014. Release 14-266. Retrieved 8 October 2014. ^ Vij, Shivam (5 November 2013). "India's Mars mission: worth the cost?". Christian Science Monitor. Retrieved 13 October 2014. ^ Rai, Saritha (7 November 2013). "How India Launched Its Mars Mission At Cut-Rate Costs". Forbes. Retrieved 26 September 2014. ^ a b David, Leonard (16 October 2013). "India's First Mission to Mars to Launch This Month". Space.com. Retrieved 16 October 2013. ^ a b c d e f g h i Lele, Ajey (2014). Mission Mars: India's Quest for the Red Planet. Springer. ISBN 978-81-322-1520-2. ^ "Multijunction Solar Cell Performance in Mars Orbiter Mission (MOM) conditions" (PDF). 2016. doi:10.1051/e3sconf/20171604001. Archived from the original (PDF) on 6 February 2019. Retrieved 6 February 2019. ^ "Mars Orbiter Mission: Major Challenges". ISRO. Archived from the original on 13 November 2013. ^ Savitha, A.; Chetwani, Rajiv R.; Ravindra, M.; Baradwaj, K. M. (2015). Onboard processor validation for space applications. 2015 International Conference on Advances in Computing, Communications and Informatics. 10-13 August 2015. Kochi, India. doi:10.1109/ICACCI.2015.7275677. ^ a b c Klotz, Irene (7 December 2016). "India's Mars Orbiter Mission Has a Methane Problem". Seeker. Retrieved 16 May 2018. ^ a b "Mars Orbiter Mission: Payloads". ISRO. Retrieved 23 December 2014. ^ Chellappan, Kumar (11 January 2013). "Amangal to budget from Mangalyaan, say experts". Daily Pioneer. Archived from the original on 17 January 2013. Retrieved 11 January 2013. ^ "Mars mission gets October, 2013 launch date deadline as India reaches out to the stars". The Indian Express. Press Trust of India. 4 January 2013. Retrieved 5 January 2013. ^ "Global Albedo Map of Mars". Indian Space Research Organisation. 14 July 2017. Retrieved 16 May 2018. ^ "Bangalore centre to control Mars orbiter henceforth". Deccan Herald. Deccan Herald News Service. 6 November 2013. Retrieved 6 November 2013. ^ Madhumathi, D. S. (6 November 2013). "Mars baton shifts to ISTRAC". The Hindu. Retrieved 6 November 2013. ^ a b "Mars orbiter well on its way". The Hindu. 18 December 2013. Retrieved 18 December 2013. ^ Jayaraman, K. S. (28 June 2013). "NASA's Deep Space Network to Support India's Mars Mission". Space.com. Retrieved 5 November 2013. ^ Rao, Ch. Sushil (3 December 2013). "Mars mission: India gets help from South Africa to monitor 'Mangalyaan'". The Times of India. Times News Network. ^ a b "Mars Mission on track; orbit to be raised on Thursday". The Economic Times. Press Trust of India. 6 November 2013. ^ a b Ram, Arun (7 November 2013). "Isro scientists raise orbit of Mars spacecraft". The Times of India. Times News Network. ^ a b c d e f g h i j k "Mars Orbiter Mission: Latest Updates". ISRO. 8 November 2013. Archived from the original on 8 November 2013. ^ a b "Second orbit raising manoeuvre on Mars Mission performed". Indian Express. Press Trust of India. 8 November 2013. ^ a b Kaping, Philaso G. (9 November 2013). "India's Mars probe performs third orbit raising manoeuvre". Zee News. Zee Media Bureau. ^ a b c Rao, Ch. Sushil (11 November 2013). "Mars mission faces first hurdle, 4th orbit-raising operation falls short of target". The Times of India. Times News Network. ^ a b c d Rao, Ch. Sushil (11 November 2013). "Mars mission: After glitch, Isro plans supplementary orbit-raising operation tomorrow". The Times of India. Times News Network. ^ Srivastava, Vanita (1 December 2013). "300 days to Mars: Countdown begins for India". Hindustan Times. Retrieved 1 December 2013. ^ "Isro's Mars Orbiter Mission successfully placed in Mars transfer trajectory". The Times of India. Press Trust of India. 1 December 2013. ^ a b c d e Lakdawalla, Emily (30 November 2013). "Mars Orbiter Mission ready to fly onward from Earth to Mars". The Planetary Society. Retrieved 1 December 2013. ^ a b "ISRO successfully performs first TCM on Mars Orbiter". Zee News. Press Trust of India. 11 December 2013. ^ a b Bagla, Pallava (11 December 2013). Ghosh, Shamik (ed.). "Mangalyaan's next successful step: a tricky mid-course correction". NDTV. ^ a b c d e "Mars orbiter gets its first course correction". The Hindu. 11 December 2013. Retrieved 4 February 2014. ^ a b c "ISRO's Mars Orbiter spacecraft has..." ISRO's Mars Orbiter Mission. Facebook.com. 9 June 2014. ^ "Mars Orbiter Spacecraft Crosses Half Way Mark of its Journey" (Press release). ISRO. 9 April 2014. Archived from the original on 6 June 2014. ^ Ganesan, S. (2 March 2014). "Health parameters of Mars Orbiter are normal". The Hindu. ^ "Trajectory correction of Mars mission likely by June 11". The Economic Times. Press Trust of India. 2 June 2014. ^ Srivastava, Vanita (1 August 2014). "Mangalyaan on track, no path correction in August". Hindustan Times. ^ a b "Mars Orbiter Spacecraft's Main Liquid Engine Successfully Test Fired" (Press release). ISRO. 22 September 2014. Archived from the original on 24 September 2014. ^ a b Lakdawalla, Emily (31 October 2013). "India prepares to take flight to Mars with the Mars Orbiter Mission (MOM)". The Planetary Society. Retrieved 2 December 2013. ^ Chandrasenan, Vishnu (20 November 2013). "First Image of Earth from ISRO's Mangalyaan". The Veracious. Retrieved 2 December 2013. ^ "Isro's Mars Mission: Why Mangalyaan's path is full of riders". Tech2. 6 November 2013. Retrieved 2 December 2013. ^ Ram, Arun (7 November 2013). "Mars mission: Scientists start raising Mangalyaan's orbit". The Times of India. Times News Network. ^ "A journey with MOM" (PDF). Archived from the original (PDF) on 23 February 2019. Retrieved 5 March 2019. ^ Lakdawalla, Emily (10 November 2013). "A hiccup in the orbital maneuvers for Mars Orbiter Mission". The Planetary Society. ^ a b "Mars mission: Isro performs last orbit-raising manoeuvre". The Times of India. Press Trust of India. 16 November 2013. Retrieved 16 November 2013. ^ Clark, Stephen (5 November 2013). "Indian spacecraft soars on historic journey to Mars". Spaceflight Now. ^ "ISRO performs TCM-2 on Mars Orbiter Mission". The Economic Times. Press Trust of India. 12 June 2014. Retrieved 5 July 2014. ^ Srivastava, Vanita (1 August 2014). "Mangalyaan on track, no path correction in August". Hindustan Times. Retrieved 19 August 2014. ^ a b Rao, V. Koteswara (15 September 2014). "Mars Orbit Insertion" (PDF). ISRO. Archived from the original (PDF) on 24 September 2014. ^ David, Leonard (15 October 2013). "India's First Mission to Mars to Launch This Month". Space.com. ^ Singh, Ritu (22 September 2014). "Mars Orbiter Mission: ISRO to test fire engine today". Zee News. Zee Media Bureau. Retrieved 22 September 2014. ^ Ram, Arun (22 September 2014). "Mars spacecraft test-fired successfully, to enter red planet's orbit on Wednesday". The Times of India. Times News Network. ^ "India's Maiden Mars Mission Makes History". Bloomberg TV India. 24 September 2014. Retrieved 24 September 2014. ^ "Mars Orbiter Mission looks to sniff methane on comet". The Times of India. India. 2014. Retrieved 4 October 2014. ^ Lakdawalla, Emily (29 September 2014). "Mars Orbiter Mission delivers on promise of global views of Mars". The Planetary Society. ^ Laxman, Srinivas (9 October 2014). "Mars Orbiter Mission shifts orbit to take cover from Siding Spring". The Planetary Society. ^ "I'm safe and sound, tweets MOM after comet sighting". The Hindu. 21 October 2014. Retrieved 21 October 2014. ^ Kumar, Chethan (26 September 2014). "Mars Orbiter Mission sends fresh pictures, methane sensors are working fine". The Times of India. Times News Network. Retrieved 6 March 2015. ^ Lakdawalla, Emily (4 March 2015). "Mars Orbiter Mission Methane Sensor for Mars is at work". The Planetary Society. Retrieved 1 April 2015. ^ "Mars Orbiter Mission extended for another 6 months". India Today. Indo-Asian News Service. 24 March 2015. Retrieved 24 March 2015. ^ "Mangalyaan can survive for 'years' in Martian orbit: ISRO chief". The Indian Express. Express News Service. 15 April 2015. Retrieved 16 April 2015. ^ "ISRO releases Mars atlas to mark Mangalyaan's first birthday in space". Zee News. Zee Media Bureau. 24 September 2015. Retrieved 27 September 2015. ^ Ahmed, Syed Maqbool (2 March 2016). "MENCA brings divine wealth from Mars: First science results from the Mars Orbiter Mission". The Planetary Society. Retrieved 31 July 2016. ^ Bhardwaj, Anil; Thampi, Smitha V.; Das, Tirtha Pratim; Dhanya, M. B.; Naik, Neha; et al. (March 2016). "On the evening time exosphere of Mars: Result from MENCA aboard Mars Orbiter Mission". Geophysical Research Letters. 43 (5): 1862–1867. Bibcode:2016GeoRL..43.1862B. doi:10.1002/2016GL067707. ^ "Long Eclipse Avoidance Manoeuvres Performed Successfully on MOM Spacecraft". Mars Daily. 24 January 2017. Retrieved 24 January 2017. ^ Vyawahare, Malavika (19 June 2017). "India's Mars Orbiter completes 1000 days in orbit and is still going strong". Hindustan Times. Retrieved 20 June 2017. 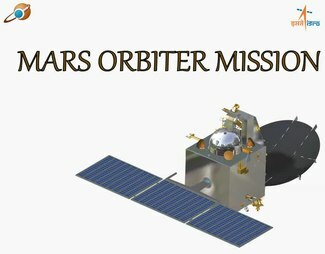 ^ "Mars Orbiter Mission (MOM) completes 4 years in its orbit". Indian Space Research Organisation. 24 September 2018. Retrieved 28 September 2018. ^ Sridharan, Vasudevan (24 September 2014). "China Heralds India's Mars Mission Mangalyaan as 'Pride of Asia'". International Business Times. Retrieved 25 March 2018. ^ Brandt-Erichsen, David (12 January 2015). "Indian Space Research Organization Mars Orbiter Programme Team Wins National Space Society's Space Pioneer Award for Science and Engineering". National Space Society. Retrieved 2 February 2015. ^ "ISRO Mars Orbiter Mission Team Wins Space Pioneer Award". NDTV. Press Trust of India. 14 January 2015. Retrieved 2 February 2015. ^ "2015 Space Pioneer Award was presented to ISRO for Mars Orbiter Mission". ISRO. 20 May 2015. Retrieved 8 June 2015. ^ "Rs 500 and Rs 1,000 banned: New Rs 2,000 currency note to feature Mangalyaan, raised bleed lines". Firstpost. 8 November 2016. Retrieved 12 November 2016. ^ Bagla, Pallava (17 February 2017). "India eyes a return to Mars and a first run at Venus". Science. ^ "National Geographic (cover)". National Geographic. November 2016. ^ COSPAR 2018: Scientific Assembly Abstracts (PDF). Cospar2018.org. 21 July 2018. ^ Singh, Kanishk (28 January 2016). "India's French Connection: CNES and ISRO jointly will develop Mangalyaan 2". The TeCake. Retrieved 29 March 2016. ^ Gupta, Prakhar (4 December 2016). "Everything You Need To Know About Mangalyaan 2, India's Second Mars Mission". Swarajya. ^ Laxman, Srinivas (29 October 2016). "With 82 launches in a go, Isro to rocket into record books". The Times of India. Times News Network. Retrieved 3 October 2018. Wikimedia Commons has media related to Mars Orbiter Mission. This page was last edited on 24 March 2019, at 22:19 (UTC).